Regarding the central role of free radicals in IR-induced cellular insults, any molecule with antioxidant capacity and free radical scavenging ability would be considered a promising radioprotector. Although natural radioprotective agents have less efficiency compared to the synthetic ones, there is a trend in using natural origins due to their low toxicity. Royal jelly (RJ) is a natural food supplement mainly secreted from the hypopharyngeal and mandibular glands of honeybees (Apismellifera). It consists of different substances including water, proteins, sugar, vitamins, and free amino acids., Features including the efficient antioxidant capacity, free radicals scavenging ability, and also oxidative stress-modulating effect ,, have made RJ attract special attention in many radiotherapy-related studies. The normalization in oxidative stress and biochemical as well as hematological markers, in irradiated rats treated with RJ, was ascribed to the RJ antioxidant capacity. Furthermore, the protective effect of RJ on radiation-induced oxidative stress was investigated in head and neck irradiated rats. In addition, oral administration of RJ to whole-body irradiated rats, 10 days before and after irradiation, led to a marked increase in antioxidant activities and resulted in a substantial reduction in oxidative stress parameters such as malondialdehyde in their lung and liver samples. Furthermore, studying the protective effect of RJ on radiation-induced oral mucositis in rats revealed its moderating role in oral mucositis-related biochemical and histopathological parameters. Moreover, two clinical trials regarding chemoradiotherapy-induced oral mucositis demonstrated an improvement in the signs and symptoms of oral mucositis and its healing time in RJ-administered head and neck cancer patients., Although there are several reports on the radioprotective effect of RJ in experimental animals,,,, there are few clinical trials regarding its radiation-modifying effect,, against radiation-induced apoptosis in particular. This is a quasi-experimental study with six healthy male volunteers (mean age 26 ± 4 years and mean body mass index 20.68 ± 2.23) recruited in April and May 2015. The aim of the study with its benefit and risk were explained to the participants. Afterward, informed consent was obtained from all individual participants. The participants were nonsmokers with no history of antibiotics and RJ consumption or medical radiation exposure during last 2 months prior to the blood samplings, and they were asked to keep their usual diets during the course of study. The study has been registered with an IRCT2014090819091N1 number in Iranian Registry of Clinical Trial and all its ethical points have been considered and approved by the Ethics Committee of Babol University of Medical Sciences, Babol, Iran. The 1000 mg RJ soft gelatin capsules were purchased from Marnys ® Company, Spain. All participants took one 1000 mg RJ capsule orally per day for 14 consecutive days. To examine the protective effect of RJ against radiation-induced apoptosis during a 14 days RJ consumption period, peripheral blood samples were collected from all participants on days 0, 4, 7, and 14 of the study. At each sampling time, 2 ml of venous blood was obtained by venipuncture into the heparinized tube from each participant. The collected heparinized samples were equally divided into two aliquots as control and irradiated groups. Five minutes prior to irradiation, the cell containing microtubes were placed in an ice water phantom and were irradiated using photon mode (6 MV) of a CLINAC (Clinical Siemens Primus Linac). 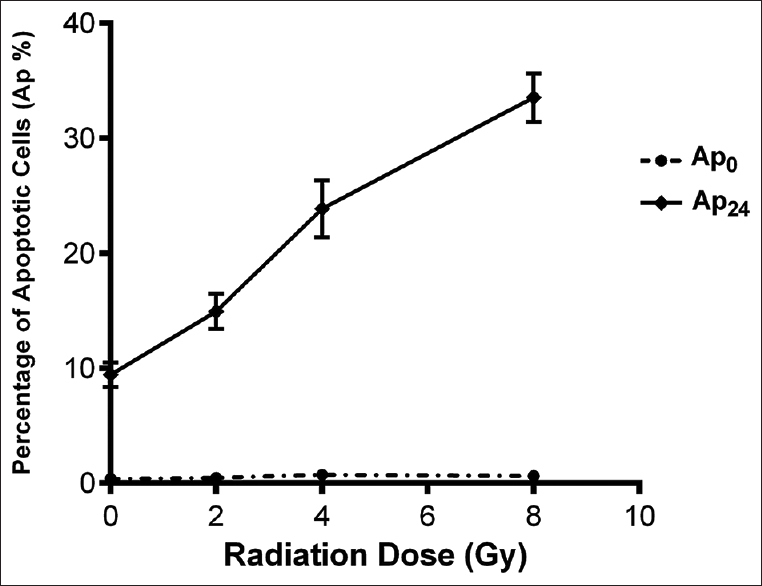 Radiation dose was 4 Gy with the dose rate of 1.8 Gy/min. In this study, apoptotic as well as nonapoptotic cells in both control and irradiated groups were assessed by the use of neutral comet assay  with some modifications, immediately after irradiation and also after a 24 h postirradiation incubation at 37°C in a humidified atmosphere of 95% air and 5% CO2. All materials were purchased from Merck Company, Germany unless otherwise mentioned. The two-window roughened side of the comet assay microscopic slides (Sotooneh, Iran) was precoated with a layer of 1% normal melting point agarose (Fermentas, Lithuania) dissolved in distilled water. 10 μl of whole blood was mixed with 140 μl of 0.75% low melting point agarose (Fermentas, Lithuania) dissolved in phosphate buffer saline. 50 μl of the mixture was overlaid on top of each window of the frosted microscope slides, covered with a coverslip and kept at 4°C for about 3 min to let the gel solidify. Then, the coverslips were gently removed and the slides were immersed in the freshly prepared lysing buffer (2.5 M NaCl, 0.1 M Na2 EDTA, 10 mM tris-base, 1% Triton X-100, 10% dimethyl sulfoxide, pH 10) for 30 min at 4°C in the dark to digest DNA-bound proteins in order not to limit the DNA migration in the electric field. Following lysing step, the slides were transferred into the tris-borate-EDTA (TBE) electrophoresis buffer (90 mM tris-base, 90 mM Boric acid and 2.5 mM Na2 EDTA, pH 8.3–8.4) for 15 min at 4°C to allow the slides to be rinsed. Afterward, the slides were transferred to a submarine horizontal electrophoresis chamber filled with the TBE electrophoresis buffer. Electrophoresis was carried out for 10 min at 20 V and 9 mA at 4°C. Subsequently, the slides were rinsed with distilled water for 5 min so as to anneal DNA and were finally dehydrated in 96% ethanol at room temperature. The air-dried slides were stained with 20 μg/ml ethidium bromide (Sigma) dissolved in distilled water and covered with coverslips for observation. The slides were viewed, and images were captured at ×200 magnification using a fluorescent microscope (E-800, Nikon, Japan) equipped with an excitation filter (510–550 nm) and barrier filter (590 nm) attached to a charge-coupled device camera. 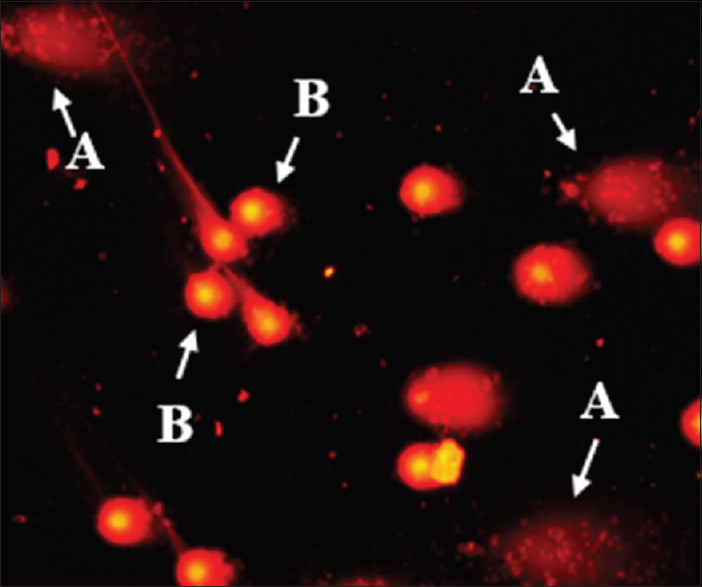 In the comet assay, apoptotic cells appear with a diffuse “fan-like” tail and a small head while normal cells have minimal DNA diffusion with a more defined head [Figure 1]. Slides were analyzed visually for the percentage of apoptotic cells (Ap %); the ratio of apoptotic cells multiplied by 100 to the number of total cells examined. Approximately, 500–700 cells were analyzed for each slide and at least 1000 cells were counted for each sample. Six experimental parameters were assessed to characterize cellular radiation effects immediately after irradiation (Ap0) and also after the 24 h postirradiation incubation (Ap24), including: (1 and 2) Baseline Ap % detectable in control cells that had not been irradiated (Ap0C, Ap24C), (3 and 4) induced Ap % measured in irradiated groups (Ap0Rad, Ap24Rad) and (5 and 6) percentage of net induced apoptotic cells (NAp %) calculated by subtracting the baseline Ap % from Ap % measured in irradiated groups (NAp0 = Ap0Rad − Ap0C, NAp24 = Ap24Rad − Ap24C). Data were analyzed using the SPSS version 16 software package for Windows (SPSS Inc., Chicago), and the figure was drawn by the use of GraphPad Prism version 6 software (La Jolla California, USA). The nonparametric Mann–Whitney U-test and Kruskal-Wallis analyses were used to determine the significance between two and more than two groups, respectively. P < 0.05 was considered as significant. All data were expressed as a mean ± standard deviation. Prior to the beginning of the study to determine the optimum dose of radiation for inducing apoptosis, an individual whole blood sample was divided into four portions. One was kept as control, and three others were irradiated with different doses of radiation ranging from 2 to 8 Gy and Ap0 and Ap24 were investigated by the neutral comet assay. Data obtained from measuring Ap0 demonstrated no significant differences among various doses of radiation, while, concerning Ap24, 4 Gy of X-ray induced a deliberate amount of Ap % [Figure 2]. Therefore, the dose of 4 Gy was selected to irradiate samples in the subsequent experiments. Results are shown in [Table 1]. Considering Ap0C and Ap0Rad, no significant difference was found between the two mentioned parameters on various sampling days (P > 0.05). In addition, data did not show a substantial difference, either among Ap0C or among Ap0Rad of different days (P > 0.05). After the 24 h postirradiation incubation, both Ap24C and Ap24Rad noticeably showed higher Ap % in comparison with their counterparts, which were immediately measured after irradiation (Ap0C and Ap0Rad, respectively), at each sampling time (P< 0.05) [Table 1]. In contrast to Ap0Rad, which was not markedly different from Ap0C, Ap24Rad was significantly higher than Ap24C on all days (P < 0.05). Based on obtained results, both Ap24C and Ap24Rad gradually reduced during the experiment [Table 1], so a significant decrease was found in each stated parameter after 14 days RJ consumption (P = 0.004 and 0.002, respectively). In order to directly investigate the role of RJ in attenuating radiation-induced apoptosis, NAp0 and NAp24 were also calculated for each sampling time. The results revealed that the mean value of NAp24 was 8.091 ± 1.890, 6.726 ± 2.710, 4.978 ± 2.130, and 4.395 ± 1.464 on days 0, 4, 7, and 14, respectively. Thus, a marked decrease was found in NAp24 after 14 consecutive days of RJ consumption (P = 0.009) [Table 1]. However, the mean value of NAp0 was 0.083 ± 0.381, 0.033 ± 0.265, 0.066 ± 0.560 and − 0.028 ± 0.577 on days 0, 4, 7, and 14, respectively and in contrast to NAp24, NAp0 did not significantly alter during the study period (P > 0.05). Cellular adaptation strategies, leading to cell survival or cell death, in response to the IR in mammalian cells, involve activation of DNA repair pathways, cell cycle checkpoints, and apoptosis. DNA, as the main target of IR, could be influenced by undesirable effects of IR through direct as well as indirect pathways. The latter is a more prominent mechanism due to the presence of water in high concentrations throughout DNA. Indeed, by splitting water molecules, IR could be able to generate free radicals including the hydroxyl radical, which is highly reactive with neighboring macromolecules such as DNA. Based on the fact that excessive amount of ROS, which leads to oxidative stress, has a crucial role in the cellular apoptotic response, the antioxidants and free radical scavengers are capable of postponing or inhibiting apoptosis. In this study, no serious side effects of RJ consumption were observed during the course of study. In a randomized placebo-controlled double-blind trial carried out by Morita et al., no serious adverse effects of daily RJ consumption for 6 months were reported. Concerning Ap0C measured on each sampling day, it could be concluded that 14 days RJ consumption did not significantly change background apoptosis during the course of study. In the present trial, incubation of control groups for 24 h at 37°C in 5% CO2 markedly raised Ap24C, so that it reached a maximum of around 11.5% on day 0. This spontaneously occurring apoptosis in control groups could primarily be ascribed to the natural ageing and death of the lymphocytes and granulocytes. The decrease seen in Ap24C during the study period could probably be justified by the increase in pro-inflammatory cytokines  and/or changes in the expression of apoptosis-related genes including p53, as the apoptosis-inducing gene, and Bcl-2, as the survival-related gene. Since RJ has both anti-inflammatory and immunomodulatory activities leading to the diminution of pro-inflammatory cytokines,, it could be presumed that the effect of RJ on the expression of apoptosis-related genes might be a more justifiable explanation for the reduction in Ap24C. Supporting these resulting data, by investigating apoptosis in liver and kidney of cisplatin-treated rats, Karadeniz et al., found that positive reactions of Bcl-xL, as an important member of Bcl-2 family, were increased in the RJ-treated group compared to the control one. the course of study. In line with these findings, the ameliorative effect of RJ administration against radiation-induced oxidative stress, biochemical impairments and histological changes in irradiated rats was previously reported. Moreover, less oxidative stress was observed in the RJ-treated irradiated group in comparison with the RJ-nontreated irradiated group in rats undergoing head and neck irradiation. In addition, in another study, a substantial reduction was stated in both oxidative stress and biochemical parameters in RJ-treated whole body irradiated rats compared to the RJ-nontreated whole body irradiated group. The exact molecular mechanism of the radioprotective effects of RJ is not clear. Nevertheless, previous studies demonstrated that antioxidant capacity and free radical scavenging ability of RJ is mainly due to its protein fractions and its polyphenolic compounds including flavonoids.,, Moreover, it has already been well-documented in the literature that the phenolic compounds are known to counteract oxidative stress by acting as powerful natural antioxidants. The decrease observed in NAp24 after 14 days RJ consumption could confirm our initial results and could emphasize on the beneficial effect of RJ against radiation-induced ROS. However, because of not being able to detect radiation-induced apoptosis immediately after irradiation, NAp0 did not significantly change during the course of study. Electron Microscopy, DNA laddering, flow cytometry, TUNEL assay, in situ end labelling method and comet assay are various approaches applied for detecting apoptotic cells, among which, comet assay is a rapid and simple technique for measuring DNA damage level and detecting apoptosis in individual cells. The consistency of this genotoxicity assay for the detection of apoptotic cells was evaluated in previous studies.,, In addition, an in vitro study with respect to investigating radioprotective effects of Vitamin C and famotidine against radiation-induced apoptosis in human peripheral blood leukocytes was previously conducted by the use of neutral comet assay. Since healthy participants cannot be exposed to IR so as to study radioprotective effects, the in vivo/in vitro method could be applied in clinical practice. Although the same sample size was used in some similar papers,,, it should be noted that the present research is limited by its sample size. Moreover, using a single dose of 1000 mg of RJ per day is another limitation of the study since it was ideal to administer different daily doses of RJ to different groups and compare resulting data. In addition, not measuring the expression of apoptosis-related genes by the molecular biological studies and not investigating the concentrations of polyphenolic compounds and/or the other antioxidants in collected whole blood samples during the course of study are the other limitations. Furthermore, not recruiting the positive control to establish the role of elevated levels of antioxidants as a result of RJ ingestion in obtained blood samples could be considered to be another limitation of the present trial. Therefore, this work will be conducted in future to elucidate the precise mechanism of the action of RJ on inhibition of apoptosis in human blood leukocytes. From the delineated data in this study, it could be concluded that IR could induce apoptosis in human peripheral blood leukocytes through the formation of free radicals leading to cellular damage. Furthermore, it could be concluded that RJ was effective in modifying radiation-induced apoptosis probably through its antioxidant capacity and free radical scavenging property. The authors wish to express their gratitude to all participants for their contributions to the study, to Ms. Rameshgar for her valuable technical assistance and cooperation, to the personnel of the radiotherapy ward of Imam Khomeini Hospital (Sari, Iran), to Ms. Abbasabadi for organizing the irradiation time, to Dr. Ghasemi and Dr. Jorsaraei for their kind advice and to Dr. Evangeline Foronda for proofreading the article. Hubenak JR, Zhang Q, Branch CD, Kronowitz SJ. Mechanisms of injury to normal tissue after radiotherapy: A review. Plast Reconstr Surg 2014;133:49e-56e. Kuntic VS, Stankovic MB, Vujic ZB, Brboric JS, Uskokovic-Markovic SM. Radioprotectors – The evergreen topic. Chem Biodivers 2013;10:1791-803. Riley PA. Free radicals in biology: Oxidative stress and the effects of ionizing radiation. Int J Radiat Biol 1994;65:27-33. Shinomiya N. New concepts in radiation-induced apoptosis: 'Premitotic apoptosis' and 'postmitotic apoptosis'. J Cell Mol Med 2001;5:240-53. Ross GM. Induction of cell death by radiotherapy. Endocr Relat Cancer 1999;6:41-4. Verheij M, Bartelink H. Radiation-induced apoptosis. Cell Tissue Res 2000;301:133-42. Mozdarani H, Ghoraeian P. Modulation of gamma-ray-induced apoptosis in human peripheral blood leukocytes by famotidine and Vitamin C. Mutat Res 2008;649:71-8. Borzoueisileh S, Monfared AS, Abediankenari S, Mostafazadeh A. The assessment of cytotoxic T cell and natural killer cells activity in residents of high and ordinary background radiation areas of Ramsar-Iran. J Med Phys 2013;38:30-3. Nagai T, Inoue R. Preparation and the functional properties of water extract and alkaline extract of royal jelly. Food Chem 2004;84:181-6. Nagai T, Inoue R, Suzuki N, Nagashima T. Antioxidant properties of enzymatic hydrolysates from royal jelly. J Med Food 2006;9:363-7. Silici S, Ekmekcioglu O, Kanbur M, Deniz K. The protective effect of royal jelly against cisplatin-induced renal oxidative stress in rats. World J Urol 2011;29:127-32. Azab KS, Bashandy M, Salem M, Ahmed O, Tawfik Z, Helal H. Royal jelly modulates oxidative stress and tissue injury in gamma irradiated male Wister Albino rats. N Am J Med Sci 2011;3:268-76. Cihan YB, Cihan C, Mutlu H, Unal D. Effect of royal jelly on serum trace elements in rats undergoing head and neck irradiation. Kulak Burun Bogaz Ihtis Derg 2013;23:37-43. Cihan Y, Ozturk A, Gokalp SS. Protective role of royal jelly against radiation-induced oxidative stress in rats. Int J Hematol Oncol 2013;23:79-87. Cihan Y, Deniz K. The effects of royal jelly against radiation-induced acute oral mucositis. Int J Hematol Oncol 2014;24:45-53. Erdem O, Güngörmüs Z. The effect of royal jelly on oral mucositis in patients undergoing radiotherapy and chemotherapy. Holist Nurs Pract 2014;28:242-6. Yamauchi K, Kogashiwa Y, Moro Y, Kohno N. The effect of topical application of royal jelly on chemoradiotherapy-induced mucositis in head and neck cancer: A preliminary study. Int J Otolaryngol 2014;2014:974967. Menz R, Andres R, Larsson B, Ozsahin M, Trott K, Crompton NE. Biological dosimetry: Phe potential use of radiation-induced apoptosis in human T-lymphocytes. Radiat Environ Biophys 1997;36:175-81. Wada S, Khoa TV, Kobayashi Y, Funayama T, Yamamoto K, Natsuhori M, et al. Detection of radiation-induced apoptosis using the comet assay. J Vet Med Sci 2003;65:1161-6. Tarang A, Mozdarani H, Akbari MT. Frequency of background and radiation-induced apoptosis in leukocytes of individuals with alpha-thalassemia variants, assessed by the neutral comet assay. Hemoglobin 2009;33:247-57. Shahidi M, Mozdarani S, Shammas S. Interindividual differences in radiation-induced apoptosis of peripheral blood leukocytes in normal individuals and breast cancer patients. Int J Radiat Res 2012;9:237-44. Wilkins RC, Kutzner BC, Truong M, Sanchez-Dardon J, McLean JR. Analysis of radiation-induced apoptosis in human lymphocytes: Flow cytometry using Annexin V and propidium iodide versus the neutral comet assay. Cytometry 2002;48:14-9. Takahashi H, Kosaka N, Nakagawa S. alpha-Tocopherol protects PC12 cells from hyperoxia-induced apoptosis. J Neurosci Res 1998;52:184-91. Jamnik P, Goranovic D, Raspor P. Antioxidative action of royal jelly in the yeast cell. Exp Gerontol 2007;42:594-600. Liu JR, Yang YC, Shi LS, Peng CC. Antioxidant properties of royal jelly associated with larval age and time of harvest. J Agric Food Chem 2008;56:11447-52. Cemek M, Aymelek F, Büyükokuroglu ME, Karaca T, Büyükben A, Yilmaz F. Protective potential of Royal Jelly against carbon tetrachloride induced-toxicity and changes in the serum sialic acid levels. Food Chem Toxicol 2010;48:2827-32. Buratti S, Benedetti S, Cosio MS. Evaluation of the antioxidant power of honey, propolis and royal jelly by amperometric flow injection analysis. Talanta 2007;71:1387-92. Morita H, Ikeda T, Kajita K, Fujioka K, Mori I, Okada H, et al. Effect of royal jelly ingestion for six months on healthy volunteers. Nutr J 2012;11:77. Kizilian-Martel N, Wilkins RC, Mclean JR, Malone S, Raaphorst GP. Prediction of radiosensitivity by measurement of X-ray induced apoptosis in human blood using the comet assay. Anticancer Res 2003;23:3847-54. McNamee JP, Bellier PV, Kutzner BC, Wilkins RC. Effect of pro-inflammatory cytokines on spontaneous apoptosis in leukocyte sub-sets within a whole blood culture. Cytokine 2005;31:161-7. Majewska E, Sulowska Z, Baj Z. Spontaneous apoptosis of neutrophils in whole blood and its relation to apoptosis gene proteins. Scand J Immunol 2000;52:496-501. Gasic S, Vucevic D, Vasilijic S, Antunovic M, Chinou I, Colic M. Evaluation of the immunomodulatory activities of royal jelly components in vitro. Immunopharmacol Immunotoxicol 2007;29:521-36. Karadeniz A, Simsek N, Karakus E, Yildirim S, Kara A, Can I, et al. Royal jelly modulates oxidative stress and apoptosis in liver and kidneys of rats treated with cisplatin. Oxid Med Cell Longev 2011;2011:981793. Siddhuraju P. The antioxidant activity and free radical-scavenging capacity of phenolics of raw and dry heated moth bean (Vigna aconitifolia) (Jacq.) Marechal seed extracts. Food Chem 2006;99:149-57. Archana M, Yogesh TL, Kumaraswamy KL. Various methods available for detection of apoptotic cells – A review. Indian J Cancer 2013;50:274-83. Olive PL, Frazer G, Banáth JP. Radiation-induced apoptosis measured in TK6 human B lymphoblast cells using the comet assay. Radiat Res 1993;136:130-6. Nascimento PA, da Silva MA, Oliveira EM, Suzuki MF, Okazaki K. Evaluation of radioinduced damage and repair capacity in blood lymphocytes of breast cancer patients. Braz J Med Biol Res 2001;34:165-76.